Hip tendonitis is not that common a condition that I see although it does present to my clinic on occasion. A tendon is a strong flexible band of fibrous tissue. The role of a tendon is to connect your muscles to your bones. You can see these as the grey / purple fibres in the picture here. Your muscles are responsible for moving your bones by contracting on demand. When your muscle contracts it is the tendon that transfers that force of movement to your bones so that they move for you! So you can see, it has a very important role! To do it’s job well, it has to be strong, firm and tough. There are many different shapes and sizes of tendons in your body. Around your hip area there are many tendons, with the main ones being the iliopsoas, pectineus, adductor longus, rectus femoris and your iliotibial tract. When these tendons in your hip are working well they glide perfectly as their related muscle contracts. These hip tendons can become inflamed for a number of reasons. When a tendon is inflamed the action of their contracting muscle pulling on them irritates them further, causing more inflammation and then pain results. This is called tendonitis. Tendonitis is an inflammation of the tendon. Although any one of your hip tendons can become inflamed - the most common ones are the tendons that have a poor blood supply as well as a high movement demand. In these poor areas of circulation, when a tendon becomes inflamed due to stress or injury, the oxygen and nutrients delivered by the blood is poor and hence healing is slow and weak also. Without rest at the early stages the inflammation may become worse and tendonitis develops. 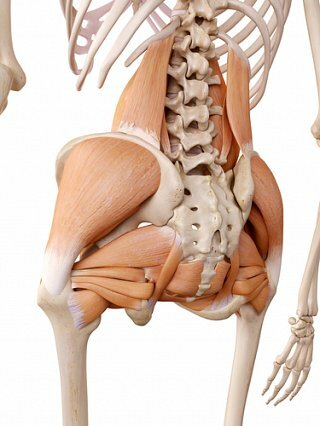 The most common hip tendonitis that I see around the hip are related to the iliotibial band and adductor longus although the other tendons can become injured also but less frequently. Hip tendonitis is often caused by overuse. If you have a small mal-alignment in your body as a result of bad posture, with repetitive movement a tendon may become strained resulting in tendonitis. A common example is if your knee cap is angled slightly towards the outside of your knee. With repetitive bending of your knee you may develop iliotibial band tendonitis over the side of your hip or knee. Tendonitis of the hip is most often seen in 35-55 year old people. At this stage their tissue is not as elastic and forgiving as it used to be and as a result can get irritated and inflamed more easily. Tenderness over the site of the tendon on palpation. Swelling of the tendon where the irritation is. Pain on movement of the tendon and its associated muscle. Audible “crunching” of the tendon as you move it. The type of treatment of hip tendonitis will primarily depend on the cause. The aim of any soft tissue injury is to remove the cause where possible followed by treatment of the symptoms. In most hip tendonitis patients, the cause is removed by improving the position of the tendons, muscles and bones using exercises, postural techniques and taping. This is followed by reducing the inflammation using ice, rest, electrotherapies and mobilisations. Rehabilitation usually takes 4-6 weeks once the cause is diagnosed correctly and treatment is started at the early stages of tendonitis. Always seek the advice and treatment of a chartered physiotherapist or physical therapist if you have any of the symptoms of hip tendonitis. Recently I assessed Johnny who complained of pain over the outside of his hip. He was a runner and had been running 5 miles, five days a week for many years. Recently, he increased his mileage to 10 miles as was in training to do a half-marathon. Pain quickly developed. On assessment, he had poor alignment of his knee-cap. It was drifting towards the outside of his leg too much. His iliotibial band was very tight and overactive as were his hamstring muscles. He had severe pain over the upper part of his iliotibial band on palpation. I treated Johnny using taping techniques over his kneecap. Quite simply I taped his kneecap into its correct position. I taught him exercises to strengthen the muscles involved in pulling his knee cap in the correct direction. I treated his inflammation and within 4 days his pain was gone. I continued to tape Johnny’s knee cap for 6 weeks while he continued his strength exercises to re-align his kneecap. By using the taping technique he was able to continue running as his iliotibial band was not being irritated. Once his knee cap was being held by his muscles in the correct position I discharged him with home exercise programme designed to stretch his iliotibial band and hamstrings, as well as exercises to strengthen his medial knee cap muscles. Johnny did well and ran his half marathon in a good time. Early intervention was the key to Johnny happy story! If you have any symptoms of hip tendonitis always seek an expert’s advice and intervention early so as to reduce the damage to your tissues as well as reduce the risk of damage beyond repair.